Cupcakes To Die For | Gourmet cupcakes for every occasion! Welcome to Cupcakes To Die For! Serving the greater San Francisco Bay area with specially crafted cupcakes for any occasion. We strive to build relationships with our current and future clients through excellent service and beautiful edible presentations. We specialize in cupcake catering for wedding receptions, corporate events, parties and showers of all kinds and sizes. Special diets? No problem – most of our flavors are available in vegan and gluten free with no compromise in taste, texture or quality. We can also create and deliver more personal cupcake arrangements for that special someone in your life. From Thursday, September 22th until Monday, October 11th, 2016 we will be out of town celebrating our wedding anniversary! From Monday, November 21st until Monday, November 28th, 2016 we will be closed for the Thanksgiving holiday. From Friday, December 23rd, 2016 until Monday, January 2nd, 2017 we will be closed for the Christmas and New Year’s holidays. From Friday, September 18th until Monday, September 28th, 2015 we will be out of town celebrating our wedding anniversary! From Monday, November 23rd until Monday, November 30th, 2015 we will be closed for the Thanksgiving holiday. From Wednesday, December 23rd, 2015 until Monday, January 4th, 2016 we will be closed for the Christmas and New Year’s holidays. Cupcakes To Die For will be closed from Friday, September 19th until Monday, October 6th, 2013. Brandy and Vlad, the owners of Cupcakes To Die for, will be hiding out to celebrate their anniversary!! 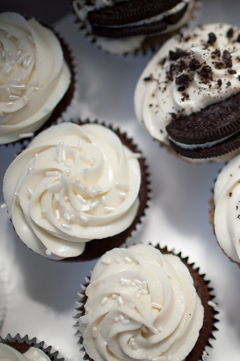 Film Noir and Cookies N' Cream cupcakes.